You are here: Home / / 5 Ways To Know If That Man Will Be A Good Father To Your Future Children. 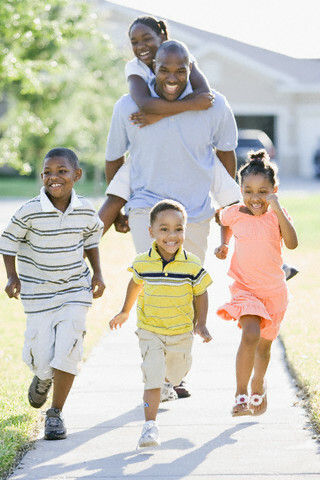 5 Ways To Know If That Man Will Be A Good Father To Your Future Children. (ThyBlackMan.com) Recently, my daughter asked me some questions about men and how to know if a man is going to be a good father to her kids. I’m a big believer in proactive vs. reactive living, meaning that an ounce of prevention really is worth a pound of cure when it comes to dealing with potential ratchetry that might invade our tranquil existence. So, I was happy to have this conversation, because I’d like for her to have the benefit of my 43 years of hindsight on what could amount to be the most important decision she’ll probably ever make. Having kids can be wonderful if you pick the right person at the right time. I recommend having a child at about age 29 for a woman. At that age, you’re mature enough to know what you want, and fertile enough to have plenty of healthy kids. Not to say that you can’t have children later, but I’d be lying if I didn’t tell you that it can be more difficult as you get older. 1) Did both of his parents play active roles in his life? Even if they live in seperate households, if he’s seen his parents get along and work together to raise a child, this is his model for parenthood. It’s even better if his parents were married, that gives him an example of what long-term, rugged commitment looks like. Studies show that children are better off in households where they are being raised by both parents. That’s not true in every case, but it’s true on average. 2) Does he have other kids? If so, is he energetically active in their lives? Having other kids can be a negative because that means that someone else is already getting his resources. But it does give you a template to determine if he’s a hard working and conscientious parent or a lazy one who is regularly AWOL and makes excuses. If given a choice, I’d rather date a good person who has children than a bad parent who will make you his/her first “victim.” Sometimes, men and women run away from dating people who have kids, but I actually found that dating a woman with children can be better than dating one who has no kids at all. Seeing how a person raises their kids tells you a great deal about the kind of parent they might be. 3) Tell him a story about a man (maybe a celeb) who doesn’t take care of his kids, then gauge his reaction. If he makes too many excuses for the man or doesn’t think it’s a big deal, then that might tell you something about his character. A real man spends less time making excuses and more time finding solutions. People tend to prioritize the things that they value. On the flip side, if he gets offended by the idea of a man not taking care of his children, this means that he likely has an ingrained value system that someone taught him which makes him view child rearing to be an important function of a man’s personal choices. Men who take care of their kids are the ones who understand how important their role happens to be. They always find a way to make a way, because they know there are consequences for their absence. You should also never use your power as a mother to keep a good man out of the lives of his children. You are only hurting your kids when you do that. 4) What’s his earning potential? Men who hustle to get either education or good economic opportunities are usually better providers for their children. Try to avoid sleeping with deadbeats, because you could be giving your future child a deadbeat parent. Men who don’t know responsibility do not deserve to have access to your body. Point blank, period. 5) Would you start a business with this person and trust him to manage the money? Having a child with another person is basically the same as starting an 18-year business with them. So, if they are typically responsible, hard-working, determined and capable, they will usually apply these same value systems to the raising of their kids. Will Smith is a good father not just by luck, but because he is wise, responsible, strong and determined. The energy that radiates from your soul spills over into nearly every aspect of your life. Lazy people create messy, chaotic lives. Sharp, focused people tend to get what they want. The well-being of your children is often a direct reflection of the kinds of choices you make as a human being. You want a father who shows responsibility with his life and makes good choices. Your future kids deserve to have the best.